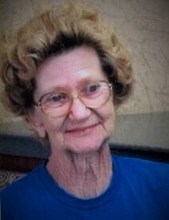 Myrtle R. Brannon Diamond, 81, of Catlettsburg on Saturday, January 19, 2019 went to be with the Lord and the love of her life Charles C. Diamond. Together they celebrated 51 wonderful years of marriage. They said their marriage was one of true love from the day they met. Myrtle was born May 24, 1937 in Spencer, West Virginia to the late Everett and Maggie Brannon. One of eight children. Myrtle moved to Kenova, WV where she met and on June 30, 1958 married Charles Diamond. They raised three children, Allen Diamond, Cheryl Ross (Scott), and Arnold Diamond (Pam). Myrtle had four grandchildren, Candice Ervin (Caleb), Sam Click (Erin), Meghanne Diamond, and Dakota Ross. Seven great grandchildren, Brayden Lee Watts, Charles Harlan Watts, Jacelynn Ayva Schrode, Jazmyn Aria Schrode, Cassius Flynte Ervin, Brynlee Ann Click, and Samuel Cade Click. Myrtle was preceded in death by three sisters, Nancy Romine, Rosie Beatty, and Kathleen Stienkie, brother, Glen Brannon, and two of her loving great grandchildren, Harlan and Jazmyn. She also leaves behind two sisters, Peggy Richie (Bill) of Big Bend, WV and Carol Reed (Roger) of Spencer, WV, brother, Arthur Brannon of Bradenton, FL, Jim Click, father of Sam, and many loving nieces, nephews, cousins, and friends. She was a member of the Methodist Church and attended Cyrus Chapel. She enjoyed spending time with her family and friends, and talking on the phone with family out of town. She also enjoyed sewing, crochet, quilting, gardening, flowers, canning, freezing, and cooking. Myrtle passed away quietly at home under the care of Cheryl, Scott, Allen, and her grandson Dakota who kept her laughing, smiling, happy, and entertained till the end, and with the much appreciated help of the Community Hospice of Ashland. Funeral Service for Mrs. Diamond will be at 1:00pm, Thursday January 24, 2019 at the Neal Funeral Home, 2409 Center Street, Catlettsburg. Pastor Kerry Bart will officiate. Final resting place in Bolt Cemetery next to her beloved Charles. Visiting hours are 6:00pm until 8:00pm Wednesday evening at the Funeral Home. In lieu of flowers donations may be made to: Community Hospice, 1480 Carter Ave., Ashland, KY 41101. To send flowers or a remembrance gift to the family of Myrtle R Diamond, please visit our Tribute Store. "Email Address" would like to share the life celebration of Myrtle R Diamond. Click on the "link" to go to share a favorite memory or leave a condolence message for the family.